My niece got a Youth Bible for her conformation from the parish and it pales in comparison to this one. I don't recall who published what she go, but this one is a great Bible. 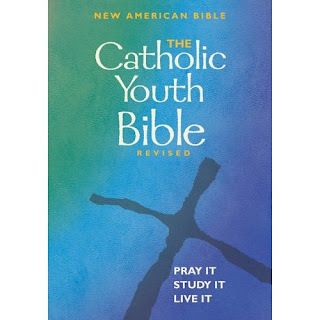 St. MAry's also publishes the Breakthrough Bible designed for tweens and it's very good as well with the GNT. Yeah, I can imagine which one your niece received. I didn't want to name any of them specifically, even though I think they are pretty uninspiring. :( Out of our price range. Too bad because it looks like a good one. We purchase Bibles every year for our first year Confirmation students. Gotta keep the price down or we can't do it at all. I'm going to have to look into this Bible for my teens. I host Sunday Snippets--A Catholic Carnival, which is a meme that allows Catholic bloggers to share their best post with others. http://rannthisthat.blogspot.com/2009/08/sunday-snippets-catholic-carnival_22.html. Please join us. I've also seen a Spanish-language Youth Bible in the style of the St. Mary's Press bible. I don't think it's available in the US and it was somewhat expensive for us here in Central America. i have this bible and i'm a teen. I want to get a bible but my problem with most of them ive tried is that i dont understand very well some words or the order of the words. Is this one easy to read? I am a teen and i absolutly LOVE this bible! I got it in the 6th grade from my parish, and it has been, hands down, the best bible i have ever used. It is easy to read and understand, and has an awesome article subject index and study aids in the back. There are awesome coloured maps in the back, and has great articles about lots of diffrent topis that are revalent to teens. The pages are thin, but are better than some other bibles and are pretty easy to take notes on. Yea I think it is fairly easy to read. Thanks for your comments! Keep up reading the Scriptures, I think it is great that you are taking the time to study God's Word. God bless!